Experience skiing innovation with these brands’ futuristic new skis, boots, apparel and more. Answering your phone with your ski glove. Controlling your boot temperature via an app. A boot liner that constantly conforms its shape to your foot. These are the ski technologies of the future – and they’re here this season. The dawn of a new ski season means the release of all the latest and greatest ski tech, and this year there is no shortage of fancy new features that any techie will want to check out. Everything from skis to apparel this year have been outfitted with tech that enhances performance, comfort and protection (and sometimes all three of those things). Brand by brand, here’s a breakdown of our favorite new tech for this season. GORE-TEX fabrics have been around for a few years now, but Spyder has seen enough to make the decision to convert all of their men’s and women’s jackets and pants to GORE-TEX. Simply put, no other fabric has proven better at protecting from rain, snow, and wind. This ultra-breathable solution to inclement weather is perfect for winter sports of all kinds and at all levels of extremity. GORE-TEX is so trustworthy, it’s tagline is even “Guaranteed to keep you dry”. The use of GORE-TEX in all of their jackets and pants means even the lowest-cost ski apparel options in Spyder’s 2019 line now come with world-class protection from the elements. Bluetooth is ubiquitous in today’s world, being used in everything from cars, headphones and even kitchen appliances. And now, KJUS is taking that tech to skiing this year. The KJUS Men’s BT2.0 Glove allows you to make phone calls without ever grabbing your phone thanks to an integrated OLED display on the cuff of the glove. Whenever you get a call or text, you can glance down at the OLED display to check who’s calling and answer at just the push of a button. The glove’s waterproof microphone and speaker is not only ultra-convenient, but you’ll feel like James Bond out on the mountain. The best part of all this is, of course, you don’t ever have to remove your gloves; even when you do have to pull your phone out to snap some pics, the Touchscreen Technology ensures seamless navigation of your smartphone screen. The hot new product for goggle-heavyweight Giro this year is their Agent Goggle, which features their new Infinity Lens Design. This frameless look allows for the lens to flow over the edge of the goggle to create an enhanced field of view. Combined with Giro’s Expansion View Technology, you can see your full mountain surroundings like never before. The Agent comes with two top-of-the-line Toric VIVID lenses to add optics that are unbelievably clear and un-distorted, and its Quick Lens Change System uses self-locating magnets to easily swap out and lock in place another lens in seconds. With Giro’s most eye-catching style yet, the Infinity Lens Design will improve optics in every sense of the word. A high-performance bib needs technical features to live up to its potential. The Oakley Bib 15k/3L Pants have their tech spelled out right in their name: the pants use 3-layer fabric and a 15k FN DRY waterproof coating for rugged durability in the backcountry and beyond. The three layers of fabric work together to create a seriously tough bib that resists wear and tear in even the most extreme of conditions. Applied to the fabric is the FN DRY protective layer, which keeps you thoroughly dry and protected from rain, snow and wind all day long. Not only that, but the FN DRY coating allows moisture to escape and evaporate so chilling sweat doesn’t ruin your day. Straight from Rossignol’s World Cup Race Department, Line Control Technology (LCT) is here to help skiers hit their lines dead on. LCT tech places a strip of either Titanal, ABS material or carbon laminate through the wood core and down the center of the ski from tip to tail. This eliminates counter flexing and neutralizes and disperses kinetic energy for the highest level of control. The result is a ski with more consistent edge contact, power and turn shape, so you can keep your skis tracking exactly where you want them to go. LCT can be found in the Experience 94 Ti, Experience 88 Ti, Experience 84 Ai and Experience 80 Ci. Hydrating during full day riding sessions has been an issue forever, and finally in the 686 Hydrastash Men’s Insulated Jacket there is a solution. The first-ever jacket with a built-in micro hydration system, the Hydrastash Jacket utilizes a secure and ergonomic water reservoir in the powder skirt that can hold .75L of water without at all limiting mobility. Conditions change; it can be warm and sunny one minute and cold and stormy another. For this reason, Salomon created Custom Heat Connect, a heated boot liner system that syncs via Bluetooth to a mobile app that allows you to have customized climate control for your feet. The Custom Heat Connect system works thanks to heating coils and a battery pack that are installed right into the liner. Once you download the Custom Heat Connect app and pair your smartphone with your boots via Bluetooth, you can set the ideal temperatures inside your liners with just the push of a button. A built-in thermostatic function will regulate and maintain your temperature no matter what the external conditions are like. The technology exists in the Salomon X-Pro 100 Men’s Boot, X-Pro 90 Women’s Boot and X-Pro 80 Women’s Boot this year, with plans to expand its use next season. Finding the perfect boot fit is one of the most important steps you can take to improve your skiing performance and comfort. Head’s Liquid Fit Technology provides a constantly-custom fit through the injection of a paraffin wax solution into the heel pocket of the boot. This solution moves to fill open areas in the heel and ankle area to form a firm, perfect fit that constantly adjusts to your foot. Best of all, the paraffin solution doesn’t ever dry or harden, meaning you can add or remove paraffin at any point to tinker with your fit. Liquid Fit Technology can be found in Head’s LYT 110 and LYT 120 Ski Boots. These days ski design is all about how you can make the lightest possible ski without affecting its performance, and that’s the premise for Atomic’s Prolite Construction. Redesigning from the ground up, Prolite Construction only uses core materials where it is absolutely necessary and only adds reinforcements in the key strategic areas to maintain ski performance at the lightest possible weight. In fact, there are even portions of the ski with no core, causing them to be see-through. These cutouts are in front of and behind the binding mounting platform and helps reduce the swing weight for easier maneuvering. Prolite Construction is featured on a handful of Atomic’s Vantage Series skis this season, for both men and women. 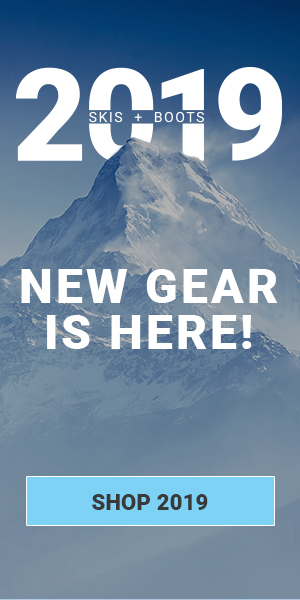 A new year equals new ski gear tech, and if you’re as excited as we are for all the new gear then head over to Skis.com and see for yourself all the brand-new tech that is available. Check out our full selection of 2019 skis, ski boots, ski accessories and more at Skis.com to become the envy of all your friends this season.